Promoter Eddie Hearn of Matchroom Sport has broken down his top five heavyweights in the division. Hearn promotes several heavyweights - including IBF, IBO, WBA, WBO champion Anthony Joshua, soon to be heavyweight Oleksandr Usyk, and has a fight by fight deal with Dillian Whyte. All of the top five heavyweights will be in action in the next few months. WBC champion Deontay Wilder will defend his belt against mandatory challenger Dominic Breazeale on May 18th, Usyk makes his heavyweight debut against Carlos Takam on May 25, Joshua defense against Jarrell Miller on June 1, Tyson Fury faces Tom Schwarz on June 15, and Whyte will face an opponent to be announced on July 13. "I think right now there are five heavyweights who are sort of... you can call them ultra-elite if you like. And they are the five best heavyweights in the world. And I'm saying Oleksandr Usyk, and I know he hasn't boxed yet at heavyweight yet, but he's the undisputed cruiserweight champion and he is a genius and I presume that he's going to be in that mix," Hearn explained to BoxingScene.com. "So I go Joshua, I go Dillian Whyte, I go Tyson Fury, I go Deontay Wilder, and I got Oleksandr Usyk. For me, they are the five best heavyweights in the world." 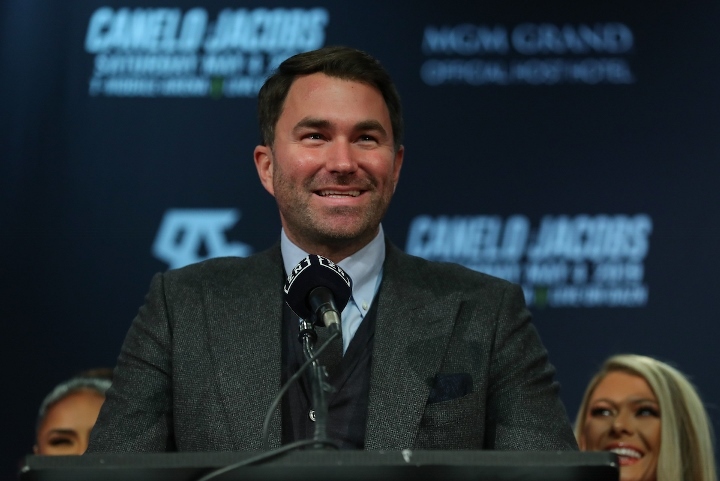 When asked to rank them order, Hearn voiced off his list and he cautions that his personal selection might be controversial - with Wilder being ranked behind three other boxers, including Whyte. "Joshua, Fury, Dillian Whyte, Wilder and Usyk. I know that might be controversial, but that's my gut feeling," Hearn said. [QUOTE=redmish;19651035]Why is he? He fought the mighty Travis Kaufman and then Christian Hammer in his last fight. He's beaten bums his whole career and got stopped the only time he stepped up. [/QUOTE]Yup, that's why Whyte don't wanna fight him??? Usyk can't beat Fury, but can beat the others.